Times change. By the end of this year, California’s Tesla Motors would have sold almost 200,000 electric cars worldwide since delivery of its first Roadster in 2008, making it the second largest global plug-in car manufacturer after the Renault-Nissan Alliance. The Tesla Roadster was a sort of prototype short-production run for the current S model, essentially a lithium battery-powered version of the Lotus Elise – 2,450 were built between 2008 and 2012. It could accelerate from 0-60 in 4sec, with a top speed of 125mph and a range of about 200 miles. Tesla is the brainchild of Elon Musk, he of Paypal, and said to be one of the 100 wealthiest men in the world. Tesla is just one of his many environmentally-friendly concepts. He was born in South Africa and his higher-education needs took place in Canada. He is now a US citizen based in California. 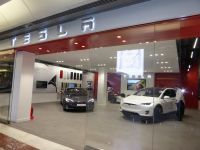 He says Tesla Motors will continue as an independent car maker aimed eventually at offering electric vehicles at prices affordable to the average consumer. The S model is a very serious (electric) motor car, a five-seat saloon that could easily be confused with the Jaguar XF. A seven-seat version is available, the extra child’s pair facing rearward where the boot should be and complying with all safety regulations. The most notable feature of the exterior is its size. The car is 0.4in longer than a Porsche Panamera and a full 3in wider. 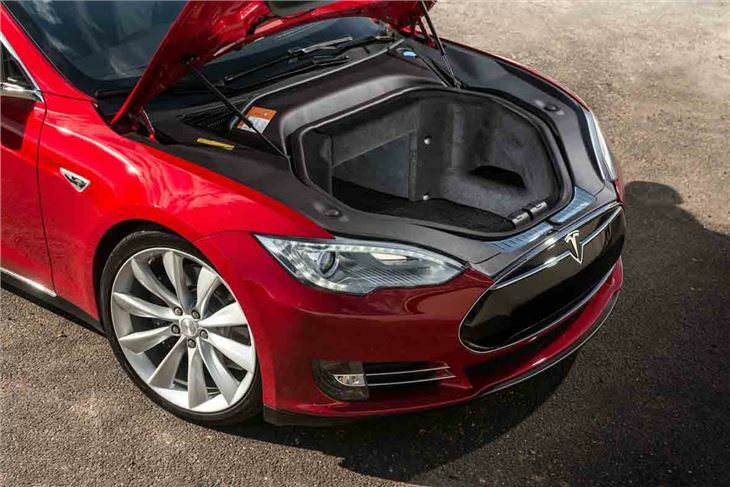 With no engine as such, the batteries are housed deep in the chassis and the luggage space is outstanding. 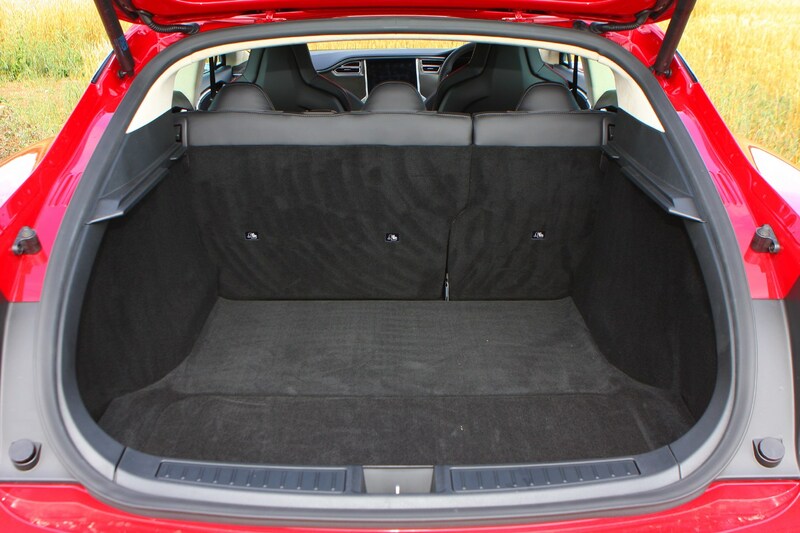 You can put things under the floor of the boot and where the engine goes in a front-wheel-drive car. The electric motor resides on the rear axle. The well-equipped basic model has an on-the-road price of £58,900, does 0-60 mph in 5.5sec with the top speed an academic 130mph. That was the one I tried for a brief road test around the roads near the company’s UK headquarters just by Heathrow. And before you ask, its range is stated to be 253 miles. There is a larger-capacity 75kWH version at £65,100, good for 304 miles, a slightly quicker all-wheel-drive version priced at £82,500, offering 346 miles, and the P100D, which will take you to 60mph in an incredible 2.5sec and has a top speed of 155mph. That will set you back £122,900. With all the cars, add £1,000 for a personal charging facility. If you want to upgrade from the lead-in car to the next one up, it is just a software change priced at £6,650. There are a number of options available, some from the factory such as the ‘Smart Air Suspension’ which raises or lowers the car when access along a poor road is required (£2,000 plus a four-month delivery wait), and others you can add including what is termed an enhanced auto pilot (£4,800) but in fact is extra sensors all around the car. As things stand, Telsa is not for everyone. It really needs a home where a unit can be plugged in quickly for an overnight charging session. Your editor-in-chief is not keen on centrally-placed information set-ups and much prefers head-up displays for navigation, with the general car information in front of him on the dashboard. He finds it safer. 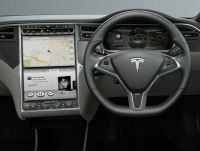 With the Tesla, attention focuses on a 17in touchscreen display that looks like a giant iPad and controls everything from the air-conditioning to the air suspension. The navigation system tells you how far you are from an electric point – not any electric point, but a Tesla-suitable one. There are currently 36 around the country, mostly at strategic service areas where, for the hour or so needed to charge the car fully, you can take a refreshment break. If you plan your journeys with care, running a Tesla should be no more difficult than with a traditional petrol/diesel car. The quality is acceptable but, for a brand determined to do its own thing, it is a surprise to find stalks and switches pinched from the Mercedes parts bin. It is a bit gimmicky in parts. The flush door handles move out from the bodywork when pressed to open the doors. It is not quite Jaguar when it comes to the interior. As you would expect, there is very acceptable room inside for five, plus the optional, factory-fitted, seats at the rear. The double-wishbone front and multi-link rear suspension has been developed under the stewardship of Graham Sutherland, a Brit who spent more than 20 years at Lotus. The handling is best described as nimble, a very easy car to drive and an interesting comparison with the Lexus 200 hybrid, the family saloon. Fine as it is, the Lexus can be best described as boring. One never knows when it is under electric drive, but it lacks any real character. 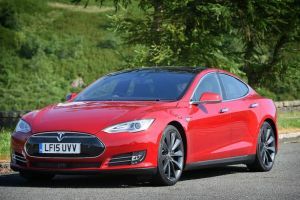 In spite of its complete silence, the Tesla is something different and notwithstanding its size and weight (it comes in at just over 2 tons – as against 1.6 with the corresponding Jaguar), is fun to drive, its performance ready and willing whenever you need it. The excellent handling is due in part to the position of the battery, low in the chassis. 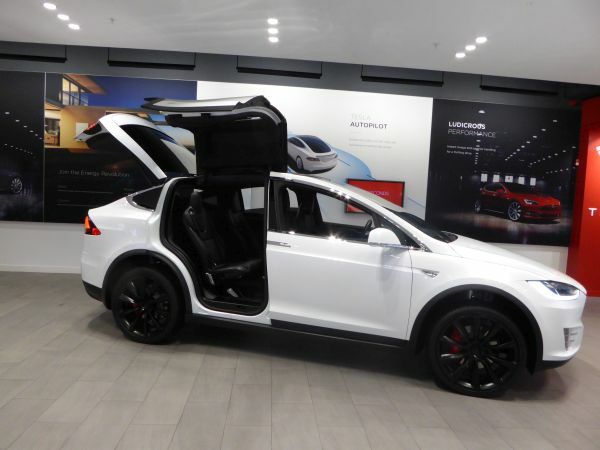 Just about to be available in right-hand-drive form is the gull-winged Tesla X, with UK prices starting at £75,000. The first British version should be ready any day now as a lovely Christmas present for someone. A smaller car, the Series 3, is due in 2017, with £40,000 said to be the target price. Tesla now has 15 stores (dealers to you and me) in the UK and has charging points in most European countries. But prepare properly for any continental journey. The future of motoring is electric. Whether Tesla can still command the number-one position for quality cars remains to be seen when the big boys come in. At the moment, it very effectively leads the race.